Shampoo and Conditioners are two different products that are used for hair. Shampoo is used to clean the hair from dirt, dust while conditioners are used to restore the moisture in the hair. A simple example would clear the confusion. You should apply shampoo to the roots of the hair. Chemicals grab the dirt and oil particles from your hair. You then wash your hair thoroughly with hot water. This way, hair will be clear of dust and dirt accumulated due to varies factors. Conditioners should not be applied to the root of the hair. They should be applied to hair with at least an inch gap between the hair and your applicable spot. There are types of conditioners and applying them varies by type. Read the article to find out how to apply conditioner to your hair the right way. As we know, shampoos are used to clean the hair from dirt. Some of us will apply gels and other chemical products for styling. All of these activities result in dry hair. If you have dry hair, the roots of your hair will become loose, and hair-fall happens. Conditioners are used to moisturize the hair. That is the reason many people are advised to use conditioners right after a head bath. Note: Do not use conditioners for dry hair. After making your hair wet, apply conditioner and after some time, you can rinse it with water. Regular conditioners can be applied after the head bath. Put it on and let it stay for a few minutes. Rinse the conditioner with water after some time. Leave-in conditioners can be applied and left alone for a few hours. Deep conditioners can be applied after a head bath and should be left for at least 20 minutes. After this time, you can rinse it off with water. Choose the conditioner based on your hair type. Types of hair are as follows. 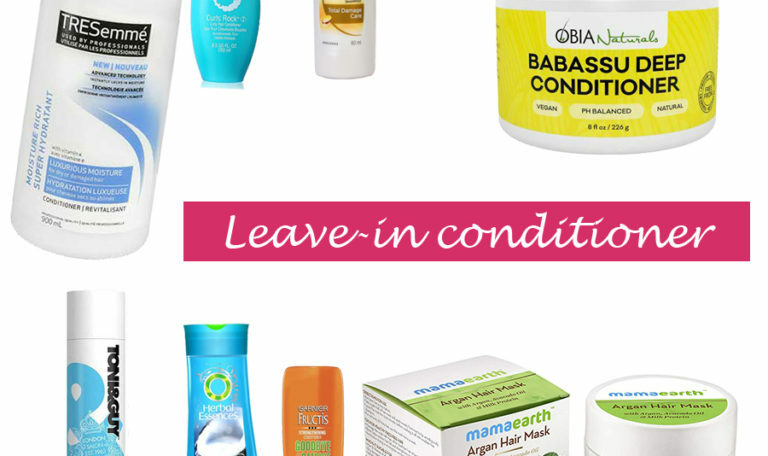 For every hair type, there exists a suitable conditioner in the market. Do your research and select the right conditioner. Have a pleasant and peaceful head bath with shampoo and hot water. Gently rub the shampoo and spread it out to entire head so that it reaches to the roots. The next step is drying your hair. Do not completely dry your hair. Make sure the water has gone out of hair and is slightly wet. Take the conditioner and gently apply to hair. Do not apply to the roots as like shampoo because it causes adverse effects like a decrease in hair growth. Apply regular conditioner to the ends of your hair. Note: Do not use conditioner daily. Using it once in a few days will give excellent and effective results. After the application of conditioner, wait for few minutes. After a few minutes, you can rinse it off with water. Doing like this will get you a soft and shiny hair. The first step would be to select the best leave-in conditioner among the products available in the market. While regular conditioner comes in a cream variant, Leave-in conditioner comes in two variants, i.e., cream and spray. Usually, the cream is used for thick and curly hair. 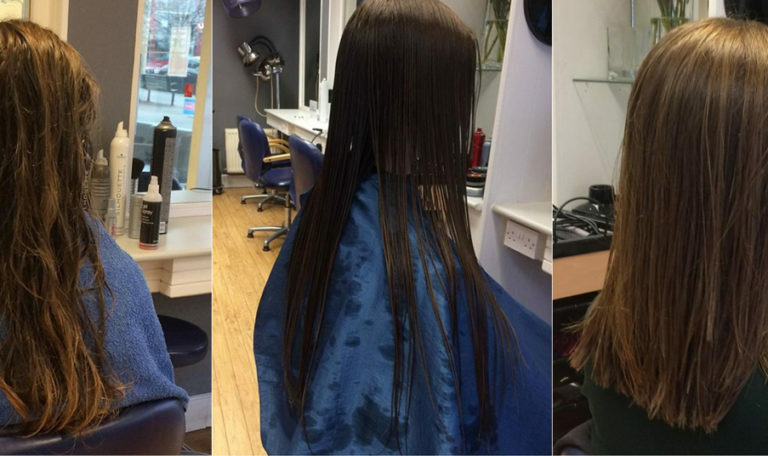 Spray can be used for people having thin hair. For applying this conditioner, damp hair state suits. So, have a bath with shampoo and thoroughly apply it to head. After the shower, make sure most of the water is dried out using a towel. Stop this process until the hair is slightly wet. Based on the thickness of hair, the amount of serum to apply varies from person to person. Take a considerable amount of serum into your hands. Apply this to your head gently without going to the roots of the hair. There is no need for rinsing the hair with water after a few minutes of the application as we did with regular conditioner. You can comb through the hair with which leave-in conditioner gets applied evenly to all sides. The primary goal of Regular and Leave-In conditioners is to improve moisture and overall health of hair. The purpose of the deep conditioner is to repair damaged and dry hair. A deep conditioner typically works for all types of hair, and so, you can buy it from well-known brands. There is no rule to shampoo your hair before applying a deep conditioner. All we need is to make your hair wet before the application of a deep conditioner. Rinse your hair with warm water thoroughly. Remove the extra water and make sure your hair is slightly wet. Take some amount of deep conditioner and gently apply to your head. This time, you can go for roots. Just like you apply shampoo, apply the deep conditioner all over the head. After the application, wait at least for 20 to 30 minutes. In the meantime, you can put a shower cap to avoid hair or cream fall off on your clothes. 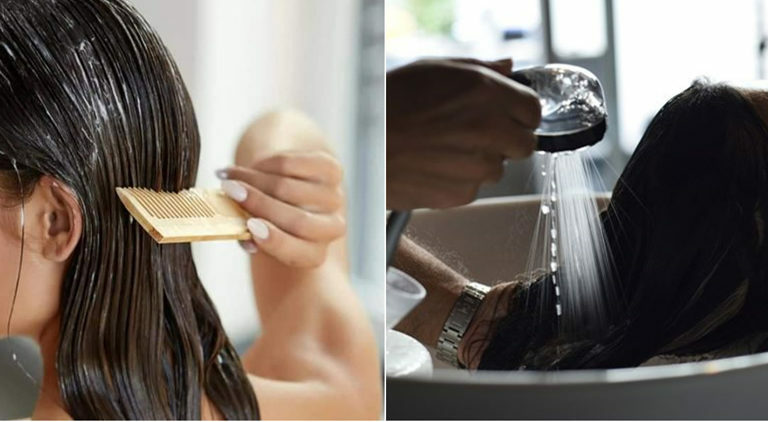 After 30 minutes, you can rinse the hair with cold water. Now, this is like a finishing touch. Remove shower cap and take a cold water shower for 5 minutes. Slowly wash your head till the conditioner goes off with the water. 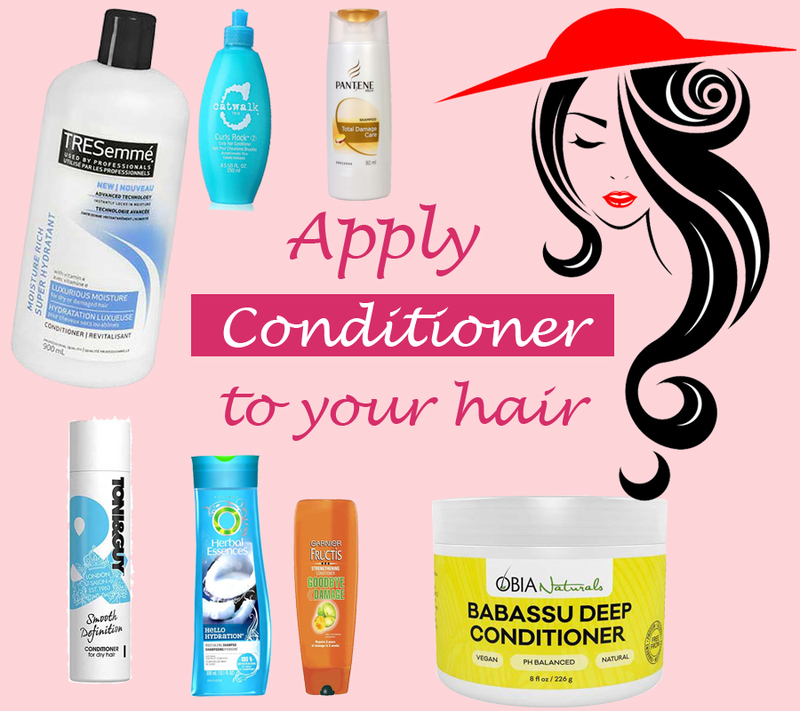 You will get surprising results after the proper application of conditioners to your hair. The above mentioned are a few types of conditioners, and you can use them as explained above. The time of recovery varies from person to person. Do not apply conditioners every day. 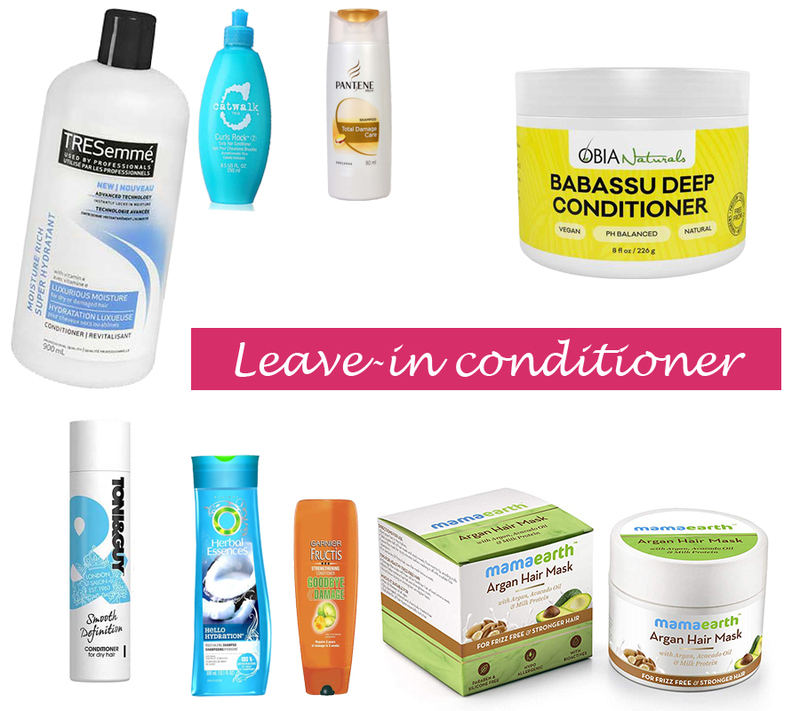 Do proper research on a brand before buying their conditioner products. You can use trial and error method to find out the products that suit your hair. If a conditioner is not giving expected results, change it and test another one. They will not give side effects only if you are careful enough to not applying the conditioner to roots of the hair.